Alisson’s Restaurant in the heart of Dock Sqquare is a great place to stop by for a round, after a round of shopping, for Happy Hour. 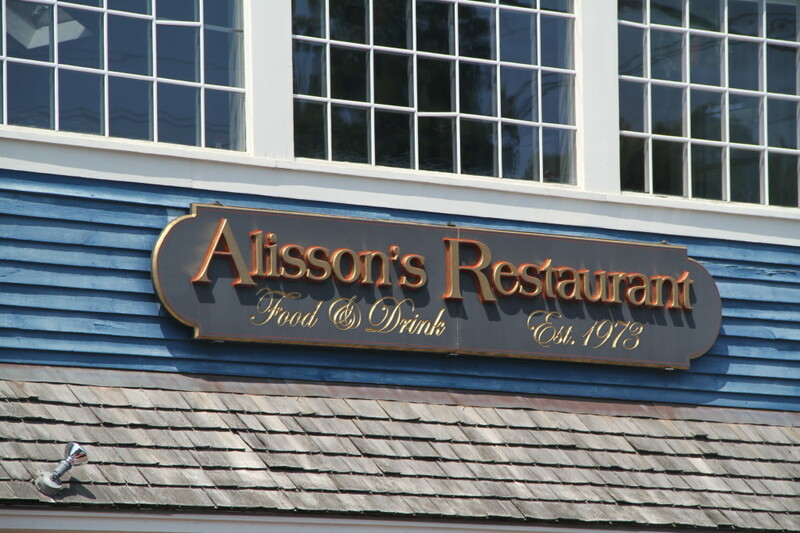 Alisson’s has a great vibe, like the Cheers of Kennebunkport, with great pub fare. Alisson’s has great deals like Wine Wednesday & Thursday $12 entrée night. Friday is karaoke. Stripers Waterside Restaurant at the Breakwater Inn – Happy Hour every day 3-6 with $3 wells, $4 house wines, and $5 beer, plus a $5 appetizer menu, and amazing views of the Kennebunk River, the Breakwater and sunsets. Also Striper’s Sunset menu is tremendous value at $15 for three courses, 4-6pm daily. The Boathouse Waterfront Hotel has Happy Hour at the bar Monday- Friday, with drink and small plate specials, daily dining deals, and a river view that should make you very happy. Happy Hour is Monday-Friday 3-6. The Kennebunkport Inn offers happy hour daily, 3-5pm, with special priced wine, beer and cocktails plus small plates. On Thursday nights its Local Dish 7-10pm with live performances from local singers and bands, and drinks specials. Old Vines Wine Bar offers half-price wine specials plus special small plates during happy hour daily 5-6pm. Old Vines has live music Thursday and Saturday nights, plus an Industry Night DJ dance party on Monday. Pearl has Happy Hour Wednesday – Saturday 5-6pm, with $7 House Wine & cocktails, $5 beers and $1.50 Oysters. Ryans Irish Corner House Pub has happy hour daily 3-5 with pint specials. Stop by 95 Ocean in Nonantum Resort where they serve nightly dining specials, entertainment nightly during the week, with waterfront views. For a more informal dining scene, you can also stop in Heckman’s Pub offering local draft beers and a comprehensive wine list, plus a delicious Maine menu. Admiral’s Table in Kennebunkport offers happy hour specials all summer plus an always reasonable poolside menu 12 to 8pm, with grilled burgers, Maine lobster rolls or a Down East Fest with steamed lobster, corn on the cob, and strawberry shortcake for dessert – all inclusive lobster dinner freshly cooked and served by the pool. Guests at this resort can sip on delicious beverages while soaking up the sun by the pool. Lodge on the Cove has a pool restaurant that also can be enjoyed during the summertime with live music Friday nights. You can also get some cocktails, pizza and enjoy the view on the deck. 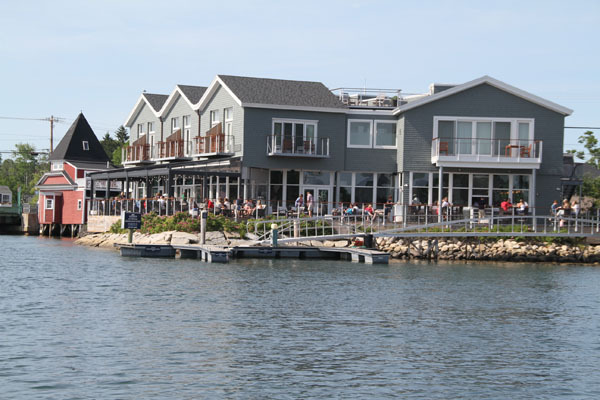 The Arundel Wharf is where the locals go on a sunny afternoon for happy hour drinks, Adirondack chairs, and a great deck overlooking the River in Kennebunkport.